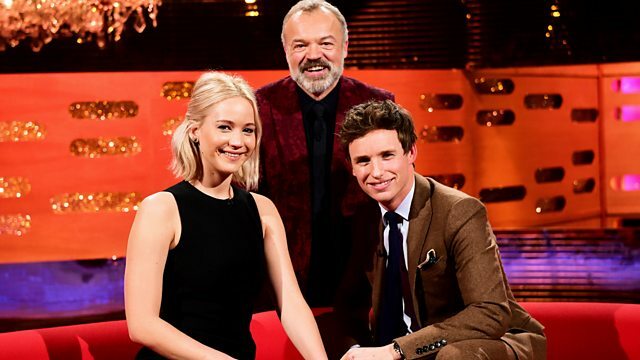 The guests on Graham's New Year's Eve sofa are Jennifer Lawrence, Eddie Redmayne, Will Ferrell and Mark Wahlberg. Plus music from Years and Years. The guests on Graham's New Year's Eve sofa are Hunger Games star Jennifer Lawrence and Oscar winner Eddie Redmayne, playing a transgender pioneer in The Danish Girl, as well as Ron Burgundy himself, comic genius Will Ferrell, and actor-producer Mark Wahlberg, together in new comedy Daddy's Home. Plus music from Years and Years, who perform one of 2015's biggest hits, Shine.